The medieval church of the Archabbey of Pannonhalma was restored over the last few months, and was solemnly reconsecrated today. 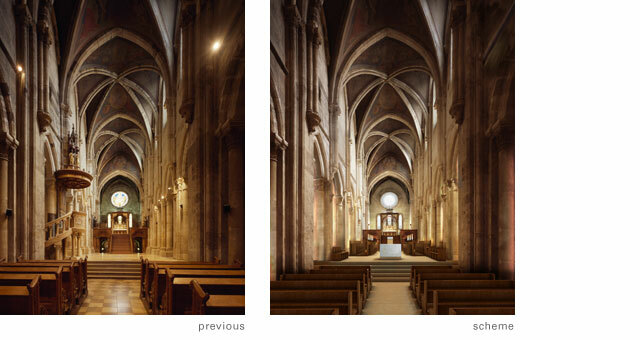 The interior reconstruction of the 13th-century abbey church was carried out according to the plans of British architect, John Pawson. 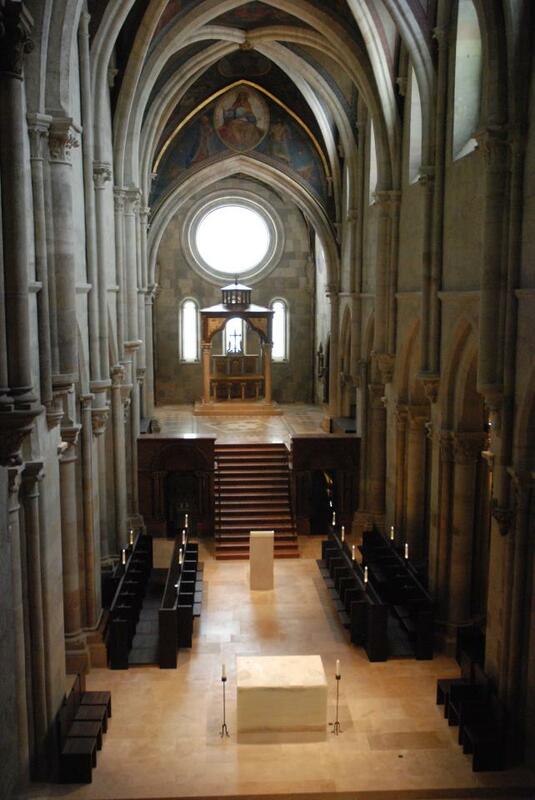 The reconstruction mainly focused on the main liturgical area of the church, the chancel and the monastic choir. The main goal of the alterations was to restore the simplicity of this space, and this meant the removal of the 19th century historicising decoration designed by Ferenc Storno (Storno similarly removed the earlier Baroque furnishing of the basilica, to make way for his own, 'historically correct' decorations - now his work suffered a similar fate). The Storno-reconstruction, which was completed in 1876, was the last major intervention inside the church. Storno's pulpit was moved to a chapel at Pannonhalma, while the 19th century stained glass windows - including the large rose window depicting the patron of the church, St. Martin - have been deposited at the Museum of Applied Arts in Budapest. On the other hand, the painted glass panes of the side aisle remained there, and the vault frescoes of Storno were cleaned. The monks of Pannonhalma took notice of Pawson when he built the Cistercian abbey church of Novy Dvur in Bohemia, and he received the commission along with a Hungarian architectural studio. 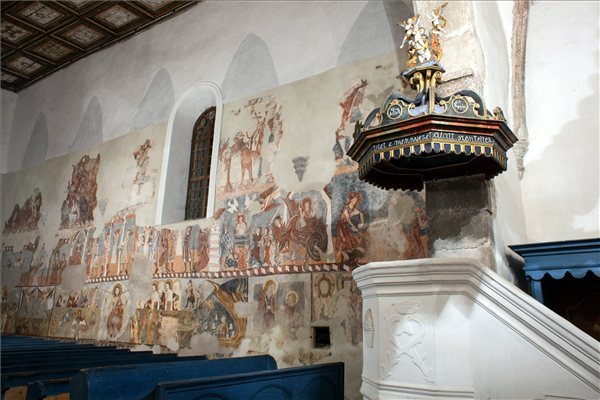 Along with the reconstruction of the church, this year also marks the completion of the rebuilding and expansion of visitor service areas at Pannonhalma. in 2010 a new visitors’ center was opened on the hilltop near the abbey. In 2011, a new entrance for visitors was opened on the bastion on top of the hill of the abbey. The Benedictine Archabbey of Pannonhalma is one of the oldest historical monuments in Hungary, founded in 996. It is a World Heritage site. 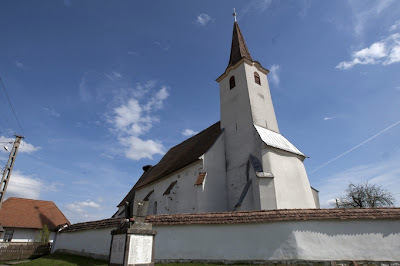 The present church of Pannonhalma was built in early Gothic style at the beginning of the 13th century during the reign of Abbot Uros, and was consecrated most likely in 1224. You can read more about the reconstruction on the website of the Hungarian Presidency of the EU. On my way to Vienna today (where my main goal was to see the exhibition on the medieval plans of the Stephansdom), I stopped at the Romanesque Abbey church of Lébény. Some alarming news emerged about the condition of the building in recent years, as photos on this Hungarian website also attest (click for 'more pictures'). Well, by now, work is well under way on the exterior restoration of the building, and almost the entire edifice is covered by a scaffolding. Heavy rain and wind prevented me to explore the building more closely, and there is also very little information available online on the ongoing restoration. Main tasks include a consolidation of the facades and the renovation of the roof of the edifice. They are also restoring the old parish building, with the intention of creating a new museum there. Work will go on throughout the summer. The Benedictine Abbey of Lébény was officially founded in 1208, and it is believed that the church was completed within a short time. Benedictine life went on with varied intensity during the Middle Ages, until the church was burned by Turkish troops in 1529, as they were marching towards the siege of Vienna. 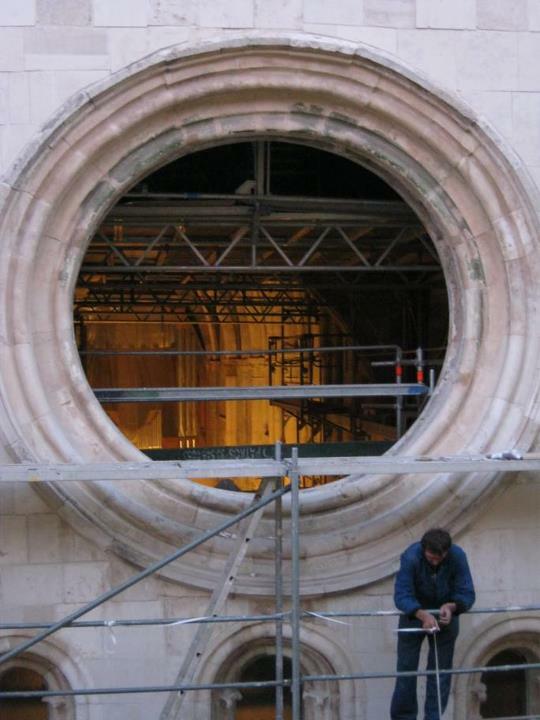 The vault of the nave was not even repaired until the Jesuits took over the church in 1631. Those knowing the history of the region will not be surprised to read that the Turkish army burned the church again in 1683, en route to another failed siege of Vienna. The building was again fixed up by the Jesuits, and finally underwent major renovation during the 1870s. Despite all these events, the church of Lébény can be regarded as one of the most intact Romanesque churches of Hungary. The fact that the church is still standing after 800 years is also due to those Italian stonemasons, who were sent there to dismantle the church at the time when the Ottoman Turks were advancing towards Győr. The stones of the monastery would have been needed to to repair the fortifications of Győr - but the masons did not carry out the job, saying the Lébény was the most beautiful church they have ever seen. Finally, here are some details of the stone carvings of the western portal seen from the lower levels of the scaffolding. The medieval castle of Siklós reopened after years of research and renovation. The castle lies in southern Hungary (just south of Pécs). 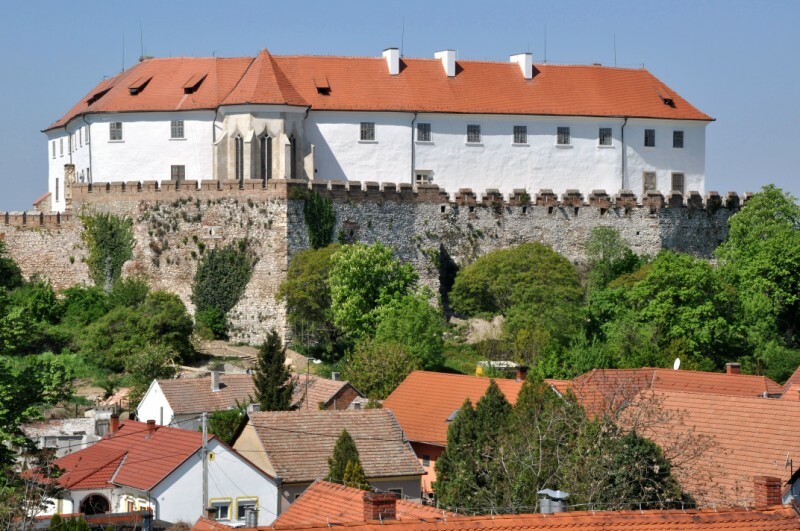 For much of the 15th century (until 1481), the castle and the large estate was in the property of the mighty Garai family - even king Sigismund was held captive here at the beginning of his Hungarian rule, in 1401. The general layout of the castle stems from this period, but it was enlarged and rebuilt in several later phases. Most significant of these campaigns was the addition of a large late Gothic sanctuary to the castle chapel, built in the second decade of the 16th century, at the time of the Perényi family. Although the castle was occupied by the Turks for almost 150 years, and was rebuilt after that in Baroque style, it still preserves a lot of significant medieval and Renaissance details (see these photos). A large new exhibition hall was created during this most recent reconstruction, which enable the display of these fragments. The reconstruction was preceded by several years of archaeological and architectural research, which brought to light many interesting finds, including a previously unknown small and painted wall niche. I hope to report on these finds in more detail soon - I am planning a trip to Siklós some time soon, and maybe a guest post can be organized with one of the archaeologists. 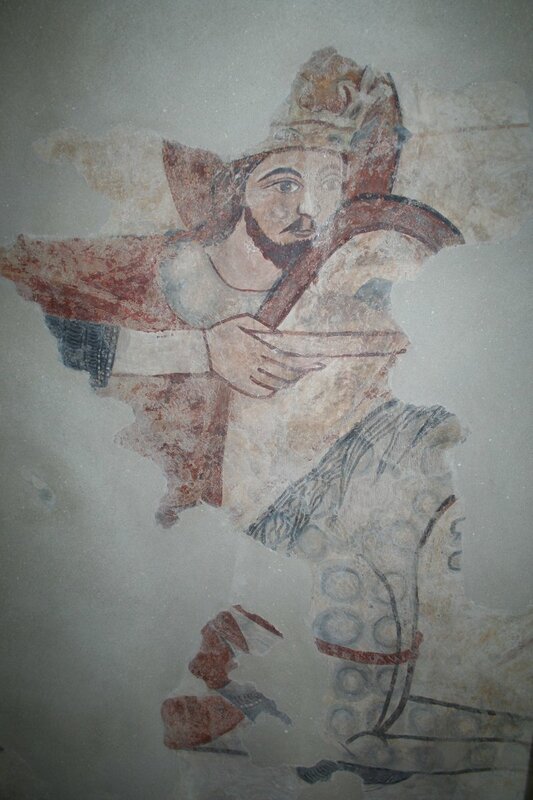 For now, here is a photo of one of the frescoes in the castle chapel, discovered during a previous restorations campaign in the 1950s. Siklós of course preserves many other treasures. I would only like to mention the former Augustinian church standing in the vicinity of the castle, which was decorated with an extensive fresco cycle at the beginning of the 15th century, commissioned by the Garai family. I have written extensively on these frescoes elsewhere - you may want to look at this Hungarian-language article with and English summary. 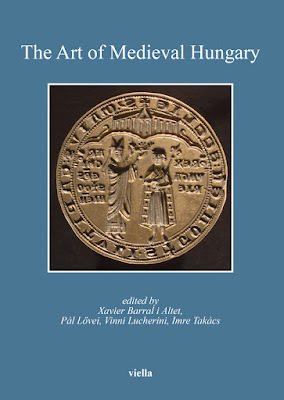 For even more information, you can have a look at my dissertation (especially if you are based at any American institution with UMI/Proquest access...).